From ancient times, the Japanese attributed natural disasters and plagues to the handiwork of onryo, grudge-bearing spirits of the dead who had died by violence or some other unnatural circumstance. In order to transform these onryo from horrors into benign deities that would use their powers for the peace and prosperity, the Japanese created Goryo Shinko, the Religion of Ghosts. Spirits or souls separating from their bodies at death is a common belief across the world. Japan is no exception. From as far back as the distant history of the Jomon period, the Japanese have built their spiritual beliefs on ghosts and the grave. The unleashed soul, called mitama or tameshi in Japanese, could cause an array of misfortunes. Of particular danger were the spirits of those who died due to political intrigue, or who were defeated in war. These spirits inflicted their revenge upon their still-living enemies. During the Heian period, folk beliefs and rituals dealing with the wrathful dead formalized into a religion. During times of national instability, when political strife and battle dominated the country, the threat of onryo loomed large. Any who died amidst the chaos were capable of sustaining a powerful hatred. And this hatred was unfocused. Onryo did not limit their revenge to those whom had wronged them in life. The method of an onryo’s revenge; plague, fire and earthquake, did not allow for such precise targeting. 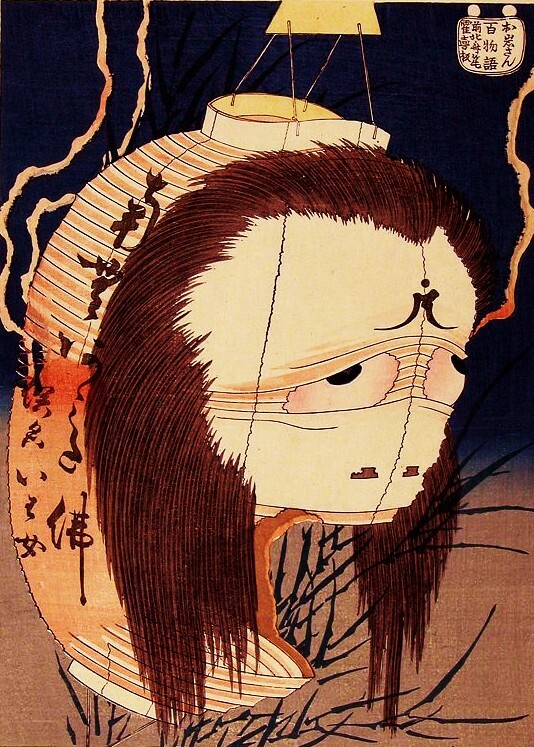 The Heian period is full of examples of these wrathful ghosts, onryo, mostly high-born and privileged in life. Fujiwara Hirotsugu, Prince Sawara, and Prince Osabe were all considered to have transformed into onryo their deaths. To calm their raging spirits, they were posthumously raised in court rank and title, then enshrined as kami in Shinto shrines. These rituals, it was said, transformed them from destroyers into protectors of after Japan. This, in essence, is Goryo Shinko; the transformation of wrathful ghosts into protective entities via ritual and entitlement. During the Heian period this religion was so pervasive there was even a ceremony in the Imperial Court welcoming new spirits into the ranks of protective spirits. According to official documents, the first such ceremony confirming goryo was on May 20th in 863CE (The 5th year of the Jyogan Era), held in Shinsenen. (From the Nihon Sandai Jitsuroku). Examples of Goryo Shinko survive to modern Japan. Kyoto has two ancient temples that remain devoted to Goryo Shinko: the Upper and Lower Goryo Shrines. The Upper Goryo Shrine enshrines the Hassho Goryo (The Goryo of the Eight Districts): Emperor Sudo (Prince Sawara, son of Emperor Konin), Emperess Inoenai (Wife of Emperor Konin), Prince Osabe (Son of Emperor Konin), Fujiwara Daibunin (Fujiwara Yoshiko, mother of Prince Iyoshin), Tachibana Daibu (Tachibana Hayanari), Budaifu (Bunya Miyatamaru), the diety Honoikatzu (Sugawara Michizane), and Kibi Daijin (Kibi Makibi). Also enshrined are Prince Shoshin, the Government Inspectors for China (Fujiwara Nakanai and Fujiwara Hirotsugu), the Emperor Sotoku, Fujiwara Yorinaga (known as the Badman of Uji), Emperor Antoku, Emperor Jyuntoku and Emperor Tsuchimikado. (“The Continued Chronicles of Japan”). But there are other opinions. In his book “Kakushita Jyujika” (“The Hidden Cross”), author Umehara Takeshi makes the unlikely (and wholly unsupported) claim that the Buddhist Prince Shotoku Taishi was an early onryo. Another author, Yaegashi Naohiki, sees evidence of onryo activity in the decline of the heads of the Soga clan (Soga Emishi and Soga Iruke). Another candidate for pre-Heian period onryo is put forward by Ootsu Miko, who identifies Tada Kazuomi in her books “Fusouryakuki” (“An Record of the Approximation of the Lands East of China”) and “Yakushiengi” (“The Omen of Yakushi Temple”). Ootsu says that the true causes of historical events can be placed on karma coming back to us from future lives. Each of these writers have some grounds for argument in their individual accounts. Another more likely candidate is put forth by Terasaki Yasuhiro, who wrote in “Jinbutsu Sousho” (“A Library of Humanity”) that the death by small pox of four children of the Fujiwara clan was cause by the onryo of Nagaya Ookimi. However, this still sets Goryo Shinko in the Heian period, as Nagaya Ookimi was a contemporary of Fujiwara Hirotsugu, and both of their stories were featured in Heian period compilations like “Shoku Nihongi.” Timewise, there isn’t much difference between the two, and whether Ookimi or Hirotsugu were first, there is scant hard evidence of onryo from any period before the Heian and Nara periods. Based not on evidence, but purely on philosophical terms, the author the author Izawa Motohiro, in his book “Gyakusetsu no Nihonshi” (“An Alternate Explanation of Japanese History”), writes that the dangerous nature of improperly worshiped ghosts is native to Japan. It runs contrary to the influences of the ancestor cult from China. While Izawa confirms that the Heian period is the beginning for formalized worship, he names the earlier collection of folkbeliefs Pre-Onryo Shinko. Iwaza also uses Nagaya Ookimi and the deaths of the four Fujiwara children as an example, showing that belief in onryo existed prior to the formalized religion of the Heian period. Izawa further advocates that Goryo Shinko should properly be called Japanese Onryo Shinko. In truth, Izawa’s theories almost perfectly reflect statements made previously by author Umehara Takeshi. There are many theories, but few actual articles written on ancient onryo. One of the most basic descriptions was made by the monk Jien, who wrote that an onryo was only as powerful as its reason for appearing. Once the spirit’s claims had been settled, it would be appeased and cease to trouble the world. Jien’s description remains accurate, and this basic description has carried through from ancient times through Japan’s middle ages and beyond.